Security matters to everyone, however security of our children is our top priority. We make sure that they are safe at school, home, and on the streets. Equally we need to provide them with a safe experience in the cyberworld. Recently, we published a blog about general online security of the children, which suggested that you take time and help your child with privacy settings on Facebook. Don't worry, if you have no clue where to start, we will guide you through the labyrinth of sophisticated security and privacy settings settings. Follow our tips to secure yourself and your child on the most popular social network. 1. Who can see your posts and images? 2. Who can contact you? 3. 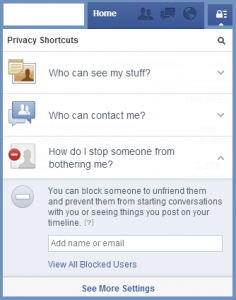 How you can help your child block harassing Facebook friends. You will find this setting in the right top corner on the blue bar, in the Privacy Shortcuts section. Click on the See More Settings to open the window below and follow our suggestions. What is the difference between the second, third and Custom options? Well, Facebook allows you to categorize your "Friends." You can label them as Close Friends, Acquaintances, as well as create some custom groups, like classmates, interest mates, colleagues etc. Once you categorize the people you are connected with, you can use different categories in this section. For example, you can select that your posts will be visible for your Friends but not Acquaintances or play with the Custom option, to moderate more precisely who will see your posts. It takes some initial effort, however it's well-invested time! We are talking about your child's privacy. The minimum option, we recommend, is selecting "Friends." You can manage more tagging options. The mechanism works in a similar way. Check all the detailed variations below, with the settings recommended by us. Again we do not recommend you to allow Everybody to see things on your Timeline, as well as turning on the review tags, before they actually appear on Facebook. That gives you better control over your reputation online, allowing you to control what has been posted about you (once you are tagged in the post on the picture) before it has been actually published. Note: It won't stop the person from posting the comment or picture, but will not link to your profile via tag. Once you manage to control your current network, it is important to set up who can find your profile and who can send you a "Friend" request. Here we can choose among two options: Everyone or Friends of Friends. (Friends are obviously excluded from sending you a friend request :) Again, we strongly recommend to prevent your child from being exposed to the public. The last setting that I would like to discuss in this article is "How to block or restrict someone." Your child might experience an unpleasant situation like bullying. There are simple tricks to help prevent this bothering or any other form of harassment. You can start with creating a Restricted List. This very handy setting, allows us to manage our Facebook relations by restricting selected persons from seeing anything on your timeline that is not public. This person won't be notified and at the same time you don't have to un-friend or block them. It can be useful to apply among your colleagues, or other acquaintances, with whom you might not feel comfortable to share your private life. However, if someone harasses you online, you can not only remove the person from the list of your friends, but also block him or her. In this way this person won't be able to see your profile anymore. Did you finish with tuning up your child's Facebook privacy settings? Well done! Now it's time to review if you didn't miss something. You can preview your profile from a different perspective. 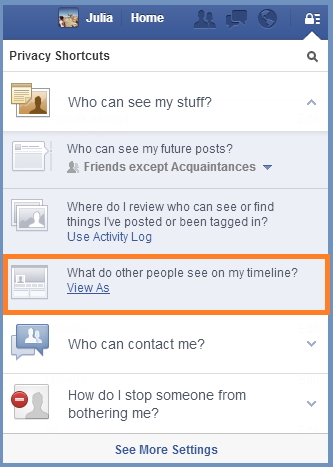 See what selected Friends and what Public Facebook users can see on your profile. Simply follow the steps illustrated below. In a follow up article, I will guide you through more security and privacy options, such as reporting a person via Facebook, blocking applications, events and invitations. We will also look at other social channels such as Instagram, Twitter, Snapchat or Pinterest, not only in the privacy settings context, but also discussing the very important question of online reputation. So stay tuned on our social media channels and follow our blog!